Detroit City was the host for this year’s Tamburitza Extravaganza presented by the Tamburitza Association of America. Twenty two bands brought there best performances to be enjoyed by everyone that attended. 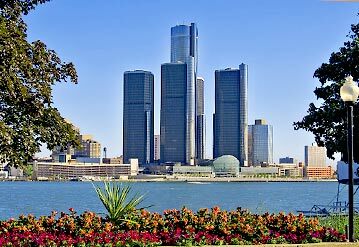 The people arriving to the city on Wednesday, the Detroit Tamburitza Committee arranged for a wonderful tour to Windsor Canada where we visited the Canadian Club Distillery. Free shots for everyone!! My kind of place. Then we went to the Blue Danube restaurant for a wonderful buffet style meal where we were entertained by the Tomicic brother’s. It was wonderful too see and hear Mike Tomicic performing again. We could have listened all night long. For the people that wanted more, they were taken to the Windsor Casino to try their luck at the tables or slots. I left some money there so I’ll have to go back to visit it sometime!! Thursday brought another great tour. We had our choice of two out three places to go. I chose the Rouge, where they assembled the Ford F150 Pickup truck and the Ford Museum. The other tour was the Greenfield Village. All the tours were fantastic, well organized, on time and scheduled perfectly. We got back in time to relax an little and listen to tambura music being played in the level one bar. The opening Dance was full of excitement with a different band every hour. On Friday there was a whole day of activities schedule for the Kolo dancers. The highlight of the day was Mark Forry giving a presentation about the beginning of the tambura. For his presentation, Ken Kosovec pulled together musicians to play song for the presentation. This group of players was awesome. It was a treat to hear the full orchestral arrangement they played. It was enough to give you goose bumps. The concert Friday featured 11 outstanding groups. Following the concert was the ever so popular Hospitality Suites where you could listen a different band every hour in 8 different rooms. Of course the music did not stop at 2:00 AM. Saturday started with the membership meeting which was followed by the concert at 1:00 where you could here 11 more outstanding groups. There was a tambura mass before the banquet. The banquet was well attended to see Frank Jovanovich, Ken Kosovec, John Kudrin, Alexander (Sanda) Pavlovich, John Ivan (Rozgaj) Rozgoy, Bogdan “Billy” Topolski and Frank Valentich get inducted into the Tamburitza Association of America Hall of Fame. After the banquet was another round of the ever so popular Hospitality Suites, with music continuing until the very early hours of the morning. The event was capped off with a Survivor Lamb Jam where we enjoyed more music and a wonderful meal of lamb with all the trimming. If you missed this one don’t get too depressed, you’ll have to make your plans to attend the next one in Reno Nevada in October 2007. We will keep you posted with details!! DETROIT, EXCELLENT JOB!! THANK YOU FOR HOSTING THIS WONDERFUL EVENT!! YOU SHOULD HAVE AUTO BEEN THERE! !